Well, my month with the Dollies is coming to a close. I still love em and hope I haven't worn my welcome out in the dollhouse....I tried to pick up after myself honestly!! I had a blast and I hope tht a few of you who may not have been as big of Dollie fans as I am (altho I can't imagine that EVER being the case!!!) may have had a chance to jump in on a challenge or two. The Dollies are great folks and I have enjoyed my stay immensely! And you can bet when they avhe thier next DT call I will be right there in line again!! Cmon now.....really?? PINK????? I am SO not a Pink girl! What to do, what to do!!!! I dug thru my stash and the only thing I had in pink was Cosmo Crickets Jolly by Golly. Then I was thinking.....omgosh my boys will just die if I scrap them in pink!!!! So more digging thru stash and pix......like my house wasn't a big enough mess before!!! Anf finally I came up with a sweet photo of a snowman the boys built last year during a snow day from school. It's hard to see but my white cardstock base is all glittery and shiny. Kinda even reminds me of freshly fallen snow when it just glitters in the light :) And I had a booger of a time getting my photo and paper to stick to it so i ahve to pull out the ol tape gun. 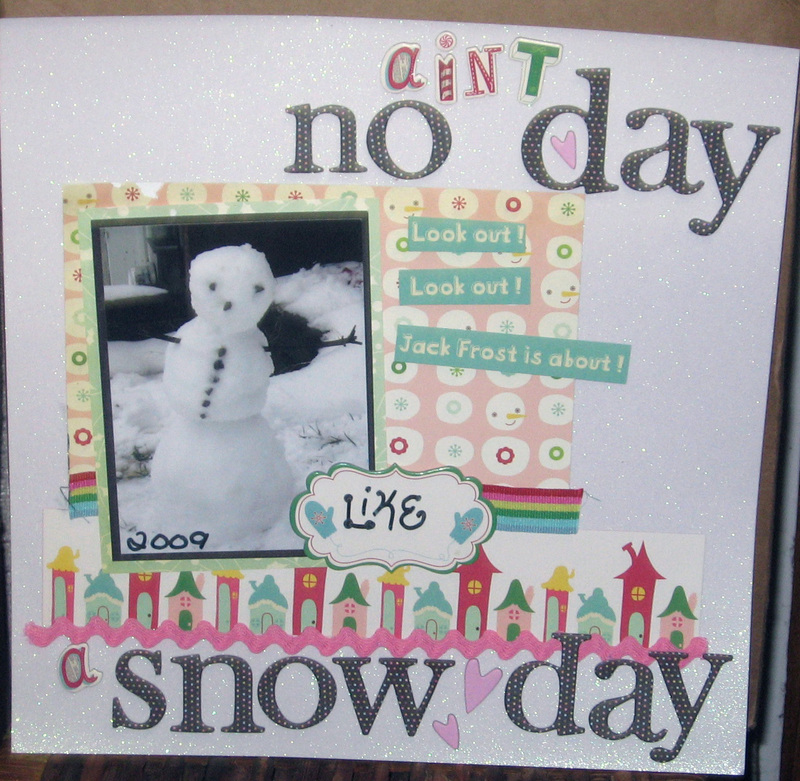 The background is DCWV and all the papers, ribbon and chipboard is Cosmo Cricket.My polka dotted alpha is Heidi Grace. The pink ric rac was a gift and worked perfectly in this LO! 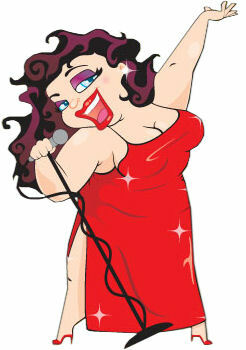 And if just playing for the pure fun of it ain't good enough for you.........look at what you could win this month!!! 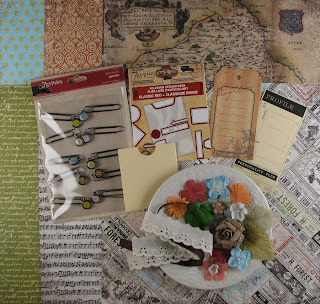 It's the "Avignon" kit from 7 Gypsies from this months AMAZING sponsor Dolce Scrapbook! Is that not yummy????? I LOVEEEEEE those paper clips!!!!! So.......................There it is.......my last Dollie assignment........wahhhhhhhhhhhhhhhhhhhhhhhh!!!!!!! Many thanks to all the wonderful gals over there....and the dude too!!! Seriously, I had fun and am grateful for the opportunity! I have said it MANY times (and even scribbled it on a couple of restroom walls) the Dollies are The Bombdiggity!!!! If you get a chance you gotta head over and play along!!!! Love your LO! I got sick toward the end of the week, so I missed my chance for last week's trifecta! Maybe I'll get to do the color challenge or this week's trifecta!